Aims and Objectives: The purpose of this study was to determine the effectiveness, by comparing the properties of boil and bite/mold formed manufactured by company and custom-made protective equipment. Materials and Methods: This was a descriptive study with population of research of professional boxing athletes. The number of samples in this study was determined based on stratified random sampling technique of 38 samples. Data collection were based on three variables. The statistical analysis for this study was done using IBM Statistical Package for the Social Sciences 17 software (SPSS Inc., Chicago, USA). Results: In the athletes users of custom-made tooth and jaw protective equipment, these results were obtained: there were 100% comfort, 100% suitable size of teeth and arch, 100% good retentiveness, 100% stomatognathic system security when used, 58.4% ease of breathing, 58.4% ease of talking, 100% lip injuries, and 25% detachment of guards. Conclusion: Overall, custom-made dental and jaw guards were superior compared to boil and bite/mouth formed dental and jaw guards. In the health aspect, hard sports, like boxing, can have a great chance to threaten dental health, and often injuries and trauma to the bones and nerves, ending up to death. Lively blows are often based on the jaw; therefore, the boxers often make a defensive for the face, especially their jaws, either with their hands or wearing a dental and jaw guards. In 1960, the integrated committee of the Bureau of Dental Health Education and the American Association for Health Physical Education and Recreation showed a literature on injuries that occurred during boxing. It is known that boxers who do not wear dental and jaw guards undergo 50% of all injuries occurring around the mouth. The committee finally decided that most of these injuries could be prevented using well-suited dental and jaw guards. The incidence rate of oral injuries among boxers is between 0.35% and 0.45%. Recent research results show that the prevalence of injury to this boxer increases compared with those previously recorded. According to Medical Committee (KTI) in 2002, injuries suffered by boxers in extremities of the head, especially based on their frequency ratings, are supraorbital and infraorbital, maxillaris, os frontale, os temporale, and stomatognathic (the most are mandibular fractures of the mandibular ramus). Blows in jaw often cause trauma or fracture of the jaw or even the tooth and jaw guards are detached. During this time, athletes, especially boxers, often experience tooth fracture and jaw injury due to blows, although already using a protector. Once observed, it turns out that the protective wear is not in accordance with the structure of the jaw and teeth of the boxers. As a result, some are too narrow and some are too loose. In addition to less comfortable to wear, if too loose, the guards made by company are easily detached. Company manufactured or conventional dental guards today are inappropriately used in the mouth, uncomfortable, unattractive, and very inelastic (rigid plastic) so that only the mouth is covered on the surface of the tooth. Preferably, the dental and jaw guard cover the whole of the surface as well as to the back so that the teeth can be locked in the formation of the dental and jaw guards to protect the jaw optimally. In addition to factory made, the athletes can also use custom-made shields adjusted to the user's intraoral conditions. The content and strength of materials, durability, brittleness, hardness, solubility, dynamism, and the importance of a custom-made protector result in better flexibility and properties in reducing shock but less power than factory made. In addition, custom-made teeth guards make users feel more comfortable, from the aspect of speech and change in the mouth. The quality of the dental and jaw guard is determined by retention, comfort, ease of speaking and breathing, the importance of the ingredients and the ability in protecting teeth, gingiva, and lips. Good dental and jaw guards should be comfortable, retentive, resilient, tear resistant, odorless, tasteless, easy to make, do not close the airway or affect breathing and speech, and are capable of providing adequate protection for teeth, jaws, and cranial structures. The purpose of this study was to determine the effectiveness of comfort, hardness, resilience of tear probability, ease of breathing, ease of speech, conformity of dental arch, retentive and protective dental, and jaw protection for stomatognathic system of boxing athletes, by comparing the nature of the factory-made protective equipment (boil and bite/mouth formed) and custom-made protective equipment as well as any injuries that can befall the boxing athletes. This was a descriptive study with population of professional boxing athletes (KTI and ATI) that did not use headgear and used protector of tooth and jaw in the form of boil and bite/mouth formed or which used custom-made protector of the dental and jaw. All the respondents who were the subject in this study had filled the informed consent that stated their willingness for intraoral examination and direct interview. Ethics approval for performing this study has been obtained from the Research Ethics Committee of Faculty of Dentistry Universitas Airlangga, with the number of ethic clearance is 136/KKEPK. FKG/VII/2016. The number of samples in this study was determined based on stratified random sampling technique, with the number of samples in boxer groups used boil and bite/mouth formed consisting of 26 boxers, while in the group of boxers who used custom-made consisting of 12 boxers. This number of samples is selected from total sampling. In this study, data were collected based on three variables with interview and temporomandibular joint (TMJ) and intraoral examination methods. Respondents were asked to provide answers according to the questions asked and made conclusions on the effectiveness of dental and jaw guard and injury stomatognathic system experienced by respondents during this after boxing. Interviews were direct because they were obtained from individual or data sources and incidentally after the boxing athlete doing boxing. The measurement scale used was nominal because it classified the three variables studied were discrete/independent and not tried because each other did not indicate rank. Variables were examined using yes or no answer (yes or no). The first variable was the effectiveness of dental and jaw protector when boxing was done by interview method, including comfort aspect (very comfortable/uncomfortable), hardness (hard enough/not hard), tooth and mouth guard resistance from possible tear (very elastic/not elastic), ease of breathing (good/not good), ease of speaking (excellent/not good), suitability of dental arch (always fit/not fit), retentiveness (very fit/not fit), and protection (pretty safe/secure). The second variable was about stomatognathic system injury because of boxing, conducted by interview method, including aspect of frequency of dental and jaw guard from inside mouth (yes/no), lip injury (yes/no), gum injury (yes/no), cracked tooth injury (yes/no), and pain in the jaw when opening and closing the jaw (yes/no). The third variable was intraoral and TMJ examination in boxing athletes. Intraoral examination for percussion tests was done by tapping the mouthpiece stalks on the teeth, when it sounded loud, it means that the percussion test was negative. If the sound was muffled, it means that the test was positive. Data were obtained by performing TMJ and percussion tests, including TMJ disturbances: joint sound, open mouth movements, protrusion movements or mandibular advance, and lateral mandibular movement. Then, a percussion test that included a loud (negative) sound or a muffled sound (positive) was also performed. The questionnaire used in this study has been tested for its validity. The validity test for the questionnaire is done by finding a correlation between the scores of each question (r result) with the r value in the table. The validity test is done twice until all questions are considered valid. Each question is declared valid if r results have a positive value and r results >r table that is at the significance level of 5% for n = x then the value of r table = x. To be declared valid, all questions must have a positive r value and value > x. The results of the validity show all valid questions. The first group of boil and bite/mouth formed samples were professional class boxers who used dental and jaw boil and bite/mouth formed that competed in TVRI Surabaya, located on Mayor Sungkono St, Pakis Village, Sawahan District, Surabaya City, East Java Province. The second group is boxers who competed in Gelora Delta Stadium Complex, located on Pahlawan, Wismasarinadi St, Magersari Village, Sidoarjo District, Sidoarjo Regency, and East Java Province as many as 26 people. Whereas, the custom-made group was a professional class boxers who used dental protector and jaw type custom made custom made in Sasana Akas, Probolinggo City, and East Java Province as many as 12 people like stated in [Table 1] and [Table 2]. The data obtained were primary and secondary data. The primary data obtained through interviews to professional boxing athletes, due to the effectiveness of wearing dental and jaw protector when boxing. Furthermore, TMJ and intraoral examinations were TMJ disorders and percussion tests. While for secondary data, it was obtained from internet and injury data of boxing athletes from scientific papers because of lack of information about guards of dental and jaw for boxing athletes, as well as areas of anatomy studies, oral surgery, conservation, periodontics, prosthodontics, dental materials, and other dentistry sciences as supporting information. Data were obtained from 38 boxers who used protective gears and jaws. A total of 26 boxers used dental and jaw guards of boil and bite/mouth formed type, while 12 boxers used custom-made dental and jaw guards. Of all respondents wearing dental and jaw guards, which had in common situations and conditions that were the equivalence of classes in the professional and still actively boxing. Results were grouped based on the effectiveness of dental and jaw guards, stomatognathic system injury, and TMJ and intraoral examination. Based on the effectiveness of dental and jaw guards, there were eight points obtained. These data were summarized in [Figure 1]. In the comparison chart, custom-made dental and jaw guards were superior to boil and bite/mouth formed one. Dental and jaw guards were custom made and more comfortable to use. 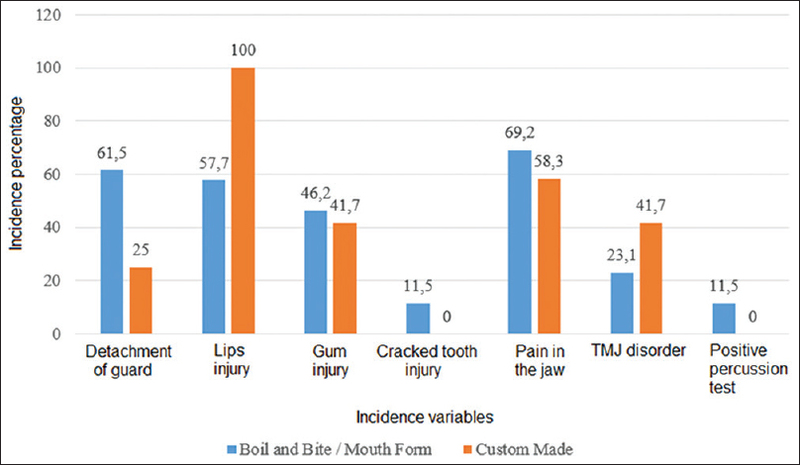 From the aspect of hardness of tooth protector and jaw when used boxing, the result is not so far, that is boil and bite/mouth formed as much as 92.4% felt hardness enough, while boxer who use toothbrush and jaw type custom made as much 91.7% felt hardness enough. From the protective aspect of tooth and jaw teeth guards from the possibility of tearing (elasticity) when used in boxing, the protector of dental and jaws of a custom made type was superior to 83.3% as the boxers claimed that the tool used was very elastic. Similar to the aspect of ease of breathing, ease of speaking, compatibility with the size of the arch, retentiveness, and protection when used, custom-made type was superior than the dental and jaw guard type boil and bite/mouth formed. Based on the stomatognathic system injury due to boxing, there were five points examined and these data are shown in [Figure 2]. In the percentage description of detachment of dental and jaw guards when used in boxing, it shows that professional boxer claimed that boil and bite/mouth formed more often (61.5%) detached compared to a custom-made tooth and jaw guards. 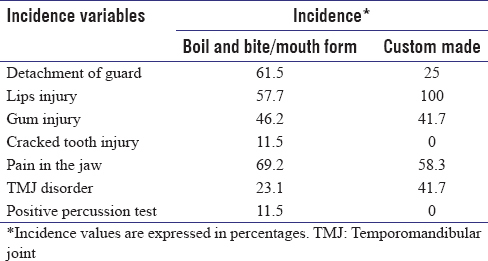 From the percentage aspect of gum injury after boxing, it showed that professional boxer who used boil and bite/mouth formed type suffered from gum injury as much as 46.2%. Whereas, boxers who used dental and jaw guards of a custom-made type suffered from 41.7% gum injury. In the percentage of the occurrence of cracked tooth injury after boxing, a sense of jaw pain as well as injury to the stomatognathic system, TMJ injury, and percussion tests, it showed that professional class boxers overcame more injuries when used boil and bite/mouth formed guards. From the results of the study and conducted statistical analysis, several aspects showed a significant difference between dental and jaw guard type boil and bite/mouth formed and custom made, in terms of effectiveness, stomatognathic injury experienced by boxers, and TMJ and intraoral disorders. 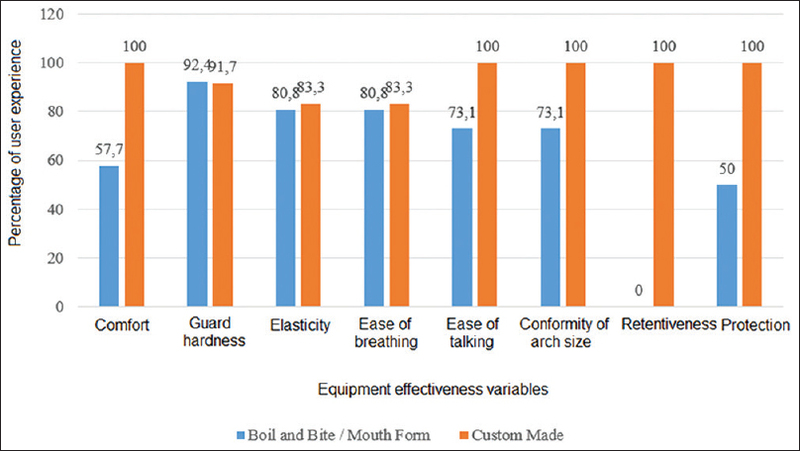 Custom-made dental and jaw guards showed superior results compared to boil and bite/mouth formed dental and jaw guards. Boil and bite is a mouth-shaped tooth and jaw protector which is the most common and popular type of dental and oral protection. Disadvantages of this type are uncomfortable to use, not retention, feels thick, and can cause breathing difficulties, and their shape is susceptible to change. In the comfort aspect, a custom-made tooth replaces and holds the lips and cheeks away from the teeth, thus preventing the antagonist teeth from excessive contact and does not irritate the gingiva and vestibule. In addition, custom-made protective gear is made in accordance with the size of each boxer's dental arch, so it is not too loose and not too narrow but fits in accordance with the needs of the boxer's arch. Custom-made protective equipment is also more fitting and fit in the mouth, attached to the oral structure, and high-precision occlusion because the thickness can be controlled during manufacture. However, there is a presumption that the retentive is not dental and jaw guard is not dependent of the shape, but depending on the hardness of the blow/blow which can lead to the release of dental and jaw guards from inside the mouth when boxing. Better yet if the shape of the tooth and jaw protector matches the structure of the jaw and teeth of the user so that it is more comfortable to wear and thinner but with optimal comfort for the stomatognathic system. The stomatognathic system is not only limited to swallowing but also includes breathing and speaking functions. A harmonious relationship between the mandible and the associated neuromuscular system and reduce the degree of tension of the muscles, nerves, and blood circulation during the masticatory function. In terms of protection, custom-made protective equipment can distribute the pressure from a blow, thus reducing trauma and fracture injuries. Custom-made jaws and jaws also adapt well enough with soft and hard tissues in the mouth and do not cause irritation and do not interfere the movement of the tongue and allows the boxer to breathe and talk because there is no excessive enlargement. For elasticity, custom-made dental and jaws have a high flexibility in reducing shock energy and distributing them throughout the occlusal of the shield. In the aspect of stomatognathic system injury due to boxing such as lip injuries, gum injuries, cracked tooth injury, pain in the jaw, to the removal of protective equipment from the mouth, in addition to the specification of protective equipment used, also influenced by the boxer's aversion in avoiding attacks from opponents and health of the boxer's stomatognathics system itself. It can also occur that the condyle rises into the glenoid fossa due to trauma to the chin. This can cause difficulty opening your mouth and chewing food. Some TMJ joint disorders have several differential diagnoses, namely, internal derangement, muscle pathology, and a combination of both. However, based on the results of research, boxers who use custom-made protective equipment have a lower percentage in injury to stomatognathic system compared with boxers who use dental and jaw guard boil and bite/mouth formed. Intraoral aspect examined from percussion tests showed similar results. After statistical analysis, there was no significant difference between the two protective devices. This can be affected by cracked tooth injury due to the harshness of the blow that the boxer had ever experienced. In terms of effectiveness, the stomatognathic system disturbance experienced by boxers after boxing, and Temporo Mandibular Joint (TMJ) and intra oral disturbances, custom made dental and jaws guards were superior to dental and jaws guards tyoe boil and bite/mouth formed. Fonseca R. Oral and Maxillofacial Surgery. 3rd ed. Philadelphia: Elsevier Health Sciences; 2017. p. 114. Surya SK. Removing Image of a Dental Artisan Tooth Extraction. 2000: 1. Powers JM, Wataha JC. Dental Materials: Foundations and Applications. 11th ed. New York: Elsevier; 2016. p. 45-55. Johnsen DC, Winters JE. Prevention of intraoral trauma in sports. Dent Clin North Am 1991;35:657-66. Rouhani A, Ghoddusi J, Rahmandost MR, Akbari M. Prevalence of traumatic dental injuries among contact sport practitioners in Northeast of Iran in 2012. JDMT 2016;5:82-3. Mouthguards; 1999. p. 1-4. Available from: http://www.drhiller.com/ mouthguards.shtml. [Last accessed on 2018 Aug 20]. Battaglia G, Giustino V. Influence of occlusal vertical dimension on cervical spine mobility in sports subjects. Acta Med Mediterr 2016;32:1593. Lindsay JS. Surgical management of ankyloses of the TMJ. J Oral Surg 1986;24:264-5. Gijwani D, Singh S, Mathur A, Makkar DK. Traumatic orofacial injuries and its prevention. Saudi J Sports Med 2017;17:70-4. What are the Best Sports Guard? P 1-4. Available from: http://www. drchan.com/mouthguards1.html 1999. [Last accessed on 2018 Aug 30]. Cawson RA. Essentials of Dental Surgery and Pathology. Singapore: Longman Singapore Publisher (Pte) Ltd.; 1993. p. 283-99. Kruger GO. Oral and Maxillofacial Surgery. St. Louis, Toronto: The C. V. Mosby; 1984. p. 364-410.